Wow… just when you think you can get your head above water, the bottom falls out and you’re back where you started. I have a lot of irons in the fire. Had them in place BEFORE things started yelling “monkey pile!” and leaping on top. This, too, shall pass. And after it’s done, it’s done. Keep doing the important things, even in the midst of additional things piling on. Just keep going. One step at a time. One foot in front of the other. You’ll get there… and then there’ll be more places to get to, more things to accomplish, more fires to put out… Just remember… IT’S ALL GOOD. Wow… I have been gone a while, huh? Apologies to you, and to me as well. I have let circumstances rule my mind. It’s been a long, dry run. I’m about give out, as they may say in the South. I feel like my life has been stolen or just disappeared. Since March, my life has changed drastically in ways that could not be foreseen. It hasn’t been very much fun and it has more or less consumed my enthusiasm. I have continued going through the motions in many ways, but not here in this blog. It’s time to remedy that. The “things” I “need” to do are endless. I cannot open my eyes and look around without them hitting me square in the face. There is no energy to remedy the needs. It’s just not in me. BAM! I was in! Like cracking a code, or finding a key – I have motivation. I will do what’s important. And now? Begin writing my blog. Again. 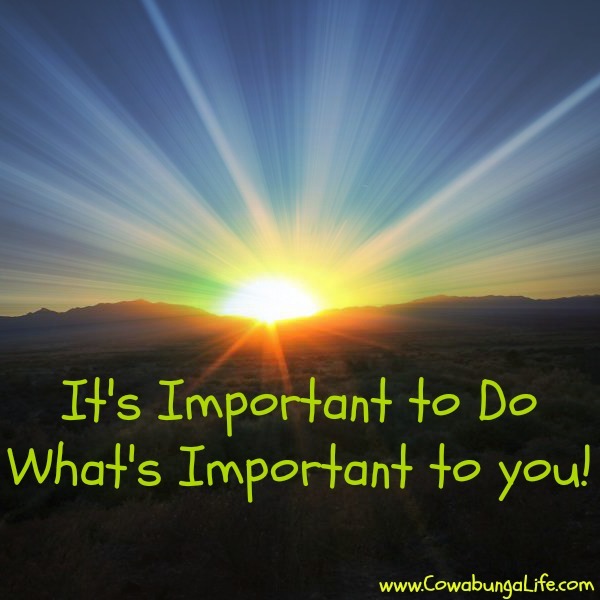 If you’re stagnant and can’t get a foothold, then just do what’s important. Whatever that is to you. You decide. Well, go ahead. It works great! BAM – just do it. Thank you for your patience, and understanding. I love you for that.